The one and only thing I was sure of when I was pregnant the first time was that Bimmer was going to come out with a lot of hair. And she didn't disappoint. Over the past almost 3 years, we have let it grow. I have never wanted her to have bangs, and I wasn't sure I wanted to ever cut out her leftover curls, so we just never broke down and cut it. But alas, it was time. We were having professional maternity photos taken and I wanted her to not risk looking disheveled. 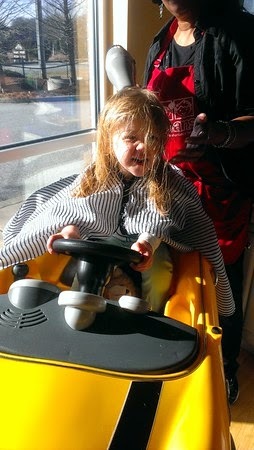 Plus, with her now using the potty, the long hair was starting to get a little ridiculous. 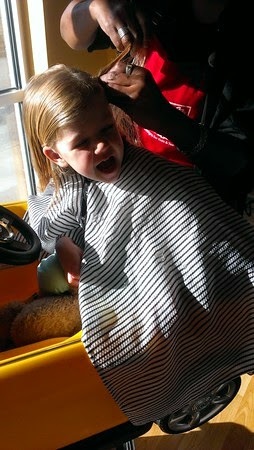 So early on a Saturday morning in early March, Puff and I took her for her first haircut. I was very specific in doing research ahead of time to find a place that friends recommended AND where I could make an appointment. Even though Bimmer loves a good bath and we had discussed her having to get her hair washed, she was very tense and not so keen on having it washed at the salon. (Yes, I'm calling it a salon for lack of a better term!) 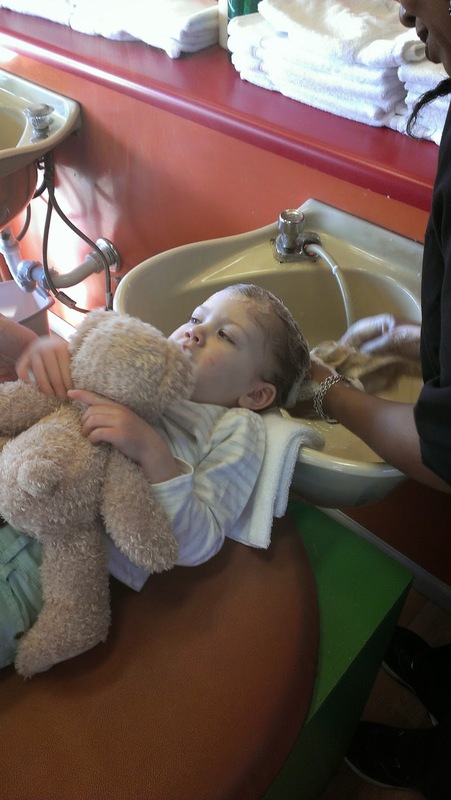 I just held her hand, and she held her teddy bear, and we got through it relatively unscathed with no tears. Of course Puff's child would select the Mini Cooper to sit in, versus the generic race car. She's probably one of very few 2 year old girls who can correctly identify it! Anyhoo... the stylist was great and gave her a little pad to draw on and would spin her around and let her watch in the mirror when she was interested. Yes, I kept a few locks of her hair - they even gave me a certificate with her name on it and the date and a little baggie with the clippings. Not a lot - but enough to satisfy me. Puff thought I was crazy. Listen, bucko - it's not like I'm saving her teeth. That will DEFINITELY not be happening! The stylist asked Bimmer if she wanted a braid, and she was all for it. 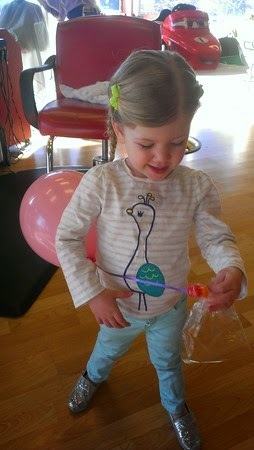 In fact, she got a spiffy "princess braid" like one of the characters in Frozen. (Which I have mentioned before, we aren't obsessed with.) 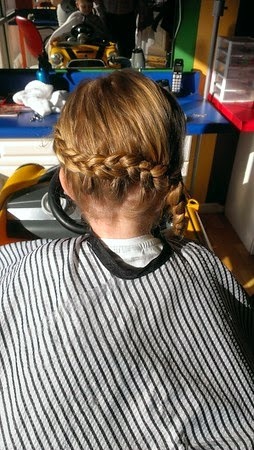 Several of the other stylists came over to look at it (it was called a "dutch braid" apparently) and even a mom there with her two sons came over to inspect it after all the oohs and aahs. All told, it was a pleasant experience. 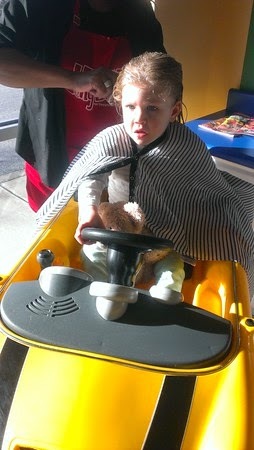 And since it was her first ever haircut, it was free! 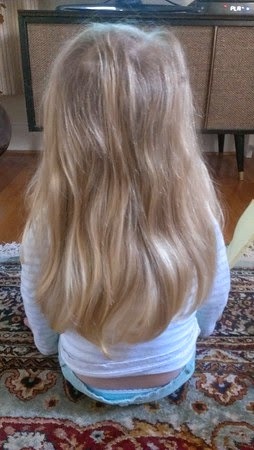 The stylist kept commenting on Bimmer's gorgeous natural highlights and how many parents can only wish their almost-3 year old had that much gorgeous hair. I'm biased, but I definitely think it's gorgeous! Afterwards, she got a balloon with jelly beans and we treated her to a trip to Dunkin Donuts (who are we kidding - that was totally an excuse for the pregnant mom to eat a donut or two) and then we took her to Toys R Us to pick out a prize. Since we weren't sure how it would go down, we figured bribery was the way to go. We wouldn't have really needed it, but we'll know for next time. 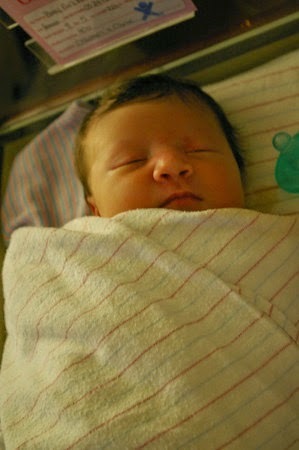 So proud of my "new big sister" and all the grown up things she is starting to do - and tackle - with confidence and grace!